Most of us have seen it, a teenager standing on the corner of a street just outside the school’s limits lighting a cigarette. Have you thought for a moment “why are they smoking?” What do we really know about why teenagers smoke, and how many are actually smoking these days. The reasons are not exactly clear, but we can assume that many teenage smokers may feel peer pressure from friends to smoke. Also, many may even have the feeling of being invincible or do it as an act of rebellion. What are the signs you should look for if you think your teen smokes, and what should you do? Smoking is an addiction, and for youth that is an even bigger problem, the minds of the young are more susceptible to becoming addicted to smoking. In fact, if smoking is to keep at its current rate (about 5.6 million) among youths 1 out of every 13 American future adults will die from smoking related illnesses. Also, in the U.S. almost 9 out of 10 smokers first tried smoking by the age of 18, and 99% first tried by the age of 26. Every day in the U.S. over 3,200 young people around the age of 18 years or younger have their first smoke. Flavored tobacco is one the biggest problems of attracting youth to smoking. 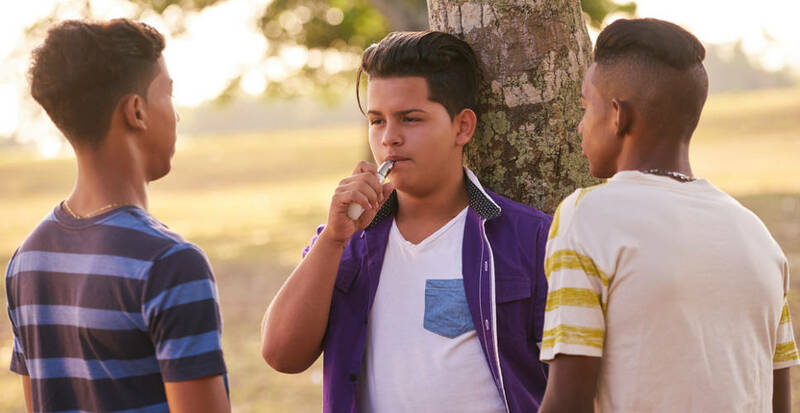 In 2014, of high school students 73% reported using flavored tobacco, and among middle school students, 56% reported using flavored tobacco during that time. Changes are occurring, from 2011 to 2016 cigarette use has declined among middle school and high school students. In 2016 about 2 out of every 100 middle school students (2,2%) said they smoked in the past 30 days – half of the 4.3% estimate from 2011. In 2016, 8 out of every 100 high school students (8.0%) reported that they had smoked in the past 30 days – a number smaller than the 15.8% in 2011. Is it that students are becoming more aware of the negatives of smoking or are they finding other ways to get what they are looking for? Electronic cigarette use is on the rise -the rates went up 0.6% for middle schoolers from 2011 and 1.5% for high school students from 2011. Overall more students are vaping now than ever before, which could be a factor in why the statistics are the way they are. What are the types of tobacco? Tobacco companies harvest and prepare nicotine-rich leaves from tobacco plants which are then dried and fermented for people to either smoke or chew. Tobacco is used in many ways like in the form of cigarettes or cigars. Other forms include smokeless tobacco which is a way people get the effects of tobacco by chewing it. More recently electronic cigarettes have become a more popular way to get the nicotine or tobacco fix. Cigarettes – Cigarettes are a mix of finely cut and cured tobacco. It’s mixed with other additives are then stuffed or rolled into a paper cylinder with many cigarettes having a filter added to them on the end. Cigars – Most cigars are made up of a single type of air-cured or dried tobacco. Regular cigars are quite larger than cigarettes. Also, they do not have a filter. Cigars contain a higher level of nicotine than cigarettes, but the smoke is usually not inhaled into the lungs. Smokeless tobacco – There are two main types of smokeless tobacco. First, is Chewing tobacco, it comes in the form of loose leaf, plug, or twist. Second is Snuff, which is a finely ground tobacco that is insufflated. Hookahs – A hookah is a pipe in which Shisha tobacco is smoked. It is a combination of tobacco, molasses and flavourings. The tobacco is heated with charcoal to produce smoke which is then filtered through water and inhaled. Pipe tobacco – Pipes are usually reusable and have a chamber or bowl, stem, and a mouthpiece. The tobacco is smoked in the bowl and inhaled through the mouthpiece. Bidis – Pronounced “bee-dees” are thin and small hand-rolled cigarettes imported to the United States. Bidis are tobacco wrapped in a tendu or temburni leaf. Bidis also come in many flavors like chocolate, cherry, mango or unflavored. Electronic cigarettes – Electronic cigarettes are battery powered devices that usually contain a cartridge with nicotine, flavoring, and other chemicals. An e-cigarette is not a tobacco by-product but a nicotine delivery system. The e-cigarettes turn the liquid into vapor which is then inhaled. What is the reasons for teens to smoke? 90% of smokers started in their teens. What is the motivation or the drive to smoke? Is it peer pressure, did their parents smoke or did they see it in a movie and think that it was cool? No answer is completely clear, and there is an abundance of reasons but let’s take a look at what some of the most common reasons are. Media made it look normal, smoking on TV or in movies can make a person think that it is okay. Peer pressure from friends or the “cool kids” can make a person give in, and potentially become addicted. Smoking parents can be a big factor to a teen starting to smoke. Easy access to cigarettes and seeing your family do it can cause a teen to smoke themselves thinking no better. A teen in a bad relationship with their family can use smoking a means to cope with a bad situation. A teen’s body may be more susceptible to addiction. Younger people also have more problems with becoming addicted to addictive substances. Genetics may play a factor in a teen’s addiction to smoking. Having an addictive personality can make the teen more likely to become addicted. The metabolism of a teenager can process nicotine much faster, thus making the teen want more adding to the addiction. A child might be more prone to nicotine addiction if his or her mother was smoking while pregnant. Stress is a huge factor in why people smoke, and that is no different for a teenager. They can use smoking as a way to deal with mental health conditions like depression, anxiety, low self-esteem or to control weight. In turn, causing them to become addicted. Here is a few thing you may want to do to prevent your teen from smoking. Talking to your teen is the first step in preventing them from trying it. Be calm and collective and go through the list together with them. How do I tell if my teen is smoking? Are you able to tell if your teen is smoking or not? Do you think they may be smoking and are not sure of the telltale signs? There are some obvious ways to tell and some much less obvious signs. Their clothes, hair, and breath will smell bad. Smell your teen’s laundry before washing. There might be burns on the carpet or seat of their car or clothes. Check bags and pockets for lighters. They might start using lots of chewing gum and mouthwash to cover up the smell. They might wear lots of cologne, even on their clothes or hair to cover up the smell. Smoking causes yellowish stains on their fingers and fingernails, look out for these changes in color as they are a clear sign of smoking. Being sick a lot can be a sign of smoking as it weakens the immune system allowing more infections of the airways. Smoking can make the teen more susceptible to colds, sinus problems, runny nose, and bronchitis. If you notice your teen is less active or lost some of his physical stamina or is short of breath it could be a sign of smoking. The teenager might keep the windows open as a possible way to vent the smoke out even with bad weather conditions outside (this can also be a sign of alcohol use). Smoking friends can lead to your teen smoking. Try and get to know your teen’s friends, and see if they smoke. If you find any signs that your teen may be smoking, talk to them as it is your best bet to get through to them. Do not push them away, work with them to find a solution to the problem. Although, it is not always that simple, what else can you do to help them – let’s take a look! Talk with them about the health effects of smoking. They might feel indestructible, and the long term effects of smoking might not mean anything to them, so focusing on the short term might wield better results. Keeping an open dialogue is one of the most important things – talk openly about your experiences, the experiences of family members, ask for their opinion, ask for details. Also, make them feel comfortable with you, it will make the situation more bearable and hopefully allow them to open up if he or she wants to get help and stop. Do not let them think that you approve of smoking though. Inform them about how smoking can affect them negatively in school and on their appearance. Smoking can impair their ability to concentrate, and the urges to smoke can make them miss class or be late. For their appearance, body image as in teeth, skin, and hair will all change with smoking. Wrinkles, bad breath, and smelly clothes may lead your teen to social anxiety. It can also cause short-term health issues such as colds, or constant coughing. Play with their ambition, remind them of their goals, try to focus their attention towards their hobbies, extracurricular activities, school (smoking might make school harder because cigarette cravings cause problems with concentration and irritability). When things start to get really bad yelling at them is not an effective way of dealing with the problem – cut the money supply. Show them you mean business, start restricting things that could lead to them smoking. Also, do not allow smoking in the house or anywhere near it. Ask why they are smoking, it is better to understand the problems or reason to why your teen smokes. Discuss the reasons and work towards finding their motivation and root cause. If they decide to quit support them through the process and get them medical help, talk to a doctor for information on the best way to quit. Finally, educate yourself about cigarette cravings. Not panicking is key to making the correct decision on how to deal with your teen, maintain a good relationship despite the cigarettes, but do not be a pushover and bend to their addiction. Yes, smoking cigarettes is an addiction and must be treated as one. However do not break your rules, make them set and clear. It is never easy dealing with an addiction, but working together as a family through the steps required to deal with it, or catching it early can prevent further addiction and get your teen back on the road to a happy, healthy smoke-free life.